At local retailers everywhere, the counter-top device where you swipe your credit or debit card is likely to become more mobile. Furthermore, mobile payment technologies are cropping up in numerous new application scenarios. Mobile point of sale (mPoS) growth continues as the technology deepens its reach across vertical industries, merchant tiers and geographies. 451 Research has forecast that the global mPoS installed base will grow from 13.3 million units today to 54.03 million units in 2019. Diverse factors including enterprise deployments, expansion into new vertical industries and financial inclusion in developing economies will serve to increase the installed base at a 32 percent CAGR during the forecast period. 451 Research defines mPoS as a smartphone, tablet or other consumer-oriented mobile device that functions as a point-of-sale terminal and facilitates payment card transactions through a wired or wireless connection to a card-accepting reader or device. The 451 Research analysts compiled the data from their study using a bottom-up market-sizing breakdown, aggregating more than 75 individual vendor shipment estimates and including direct vendor input. "Today, it's simply myopic to look at mPoS as a tool for micro-merchants. In a short time frame, it has broadened its roots across a wide swath of vertical industries and almost unanimously across all merchant tiers," said Jordan McKee, senior analyst at 451 Research. McKee believes that the mPoS momentum is at least in part linked to its diversity. The growing list of mPoS applications is helping to enable customer engagement in retailers such as Nordstrom, while driving financial services inclusion in countries such as Nigeria. According to 451 Research, rapid growth will be most evident in emerging economies where mPoS is playing a critical role in building out the electronic payments acceptance network, against a backdrop of rising consumer debit and credit card penetration. 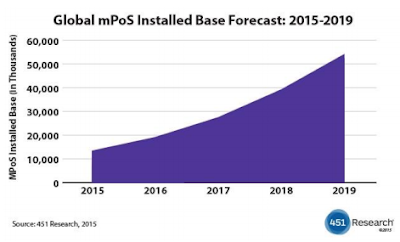 In more mature markets, such as North America, mPoS expansion continues as the technology penetrates the enterprise. 451 Research analysts believe the cadence of large-scale deployments will become consistent over the next five years, with businesses in excess of 1,000 employees integrating mPoS more holistically across their organizations. Across all company sizes, according to their assessment, there's a clear understanding of the mPoS value. Moreover, 451 Research discovered that 87 percent of IT decision-makers feel that accepting card payments on a mobile device and providing a real-time receipt is important.